Station Theater had the opportunity to work with the Houston Food Bank leadership team. We had a blast at the beautiful Baker Ripley East Aldine Campus just north of the inner loop. It was an honor to work with the people who work everyday to help Houston fight hunger, and it was a lot of fun too. Although the Houston Food Bank succeeds in feeding almost a million people in the city annually, their overall mission is even more ambitious. The team not only focuses on tackling the problem of hunger in the Greater Houston area, they also analyze the larger societal causes of hunger and approach them with innovative solutions. They have a number of programs beyond their food collection and distribution activities that are aimed at stopping the causes of hunger, including nutrition education, professional volunteer networking, and social service awareness programs. This video helps to illustrate the Houston Food Bank’s forward-thinking approach and its efforts to eliminate hunger by addressing its contributing factors. Innovative solutions take innovative teamwork. 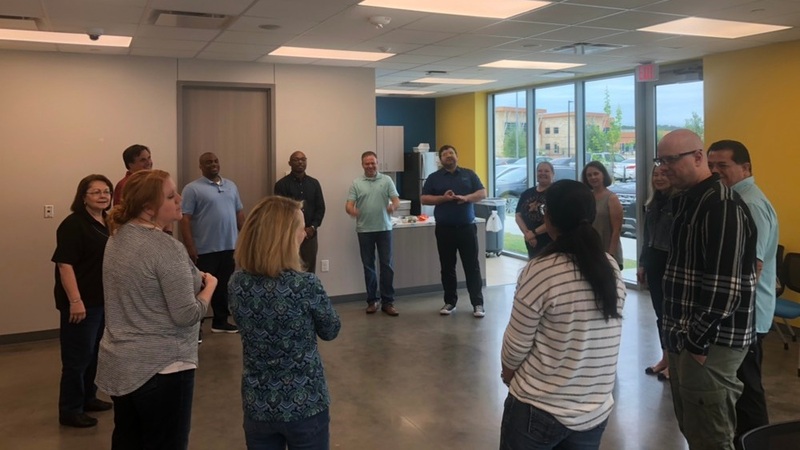 Station Theater had the chance to lead the staff in applied improv exercises to supercharge the team’s capacity for active listening, trust, group mind, and brainstorming. It was exciting to see each individual push themselves out of the ordinary work mindset and release their full creative capacity. They distribute about 122 million meals a year annually, feeding upwards of 800,000 people in the Greater Houston area. The Houston Food Bank is the nation’s largest food bank and supports 18 southeast Texas counties. Their Senior Box Program distributes meals to just under 10,000 income-eligible seniors (60+) in Harris County each month. The Houston Food Bank is a 308,000 square foot facility that includes a warehouse, kitchen and conference center. Their facilities utilize green energy with a rooftop 440-count solar panel array which covers 5,300 square feet. It can generate up to 96,000 kilowatt hours annually.